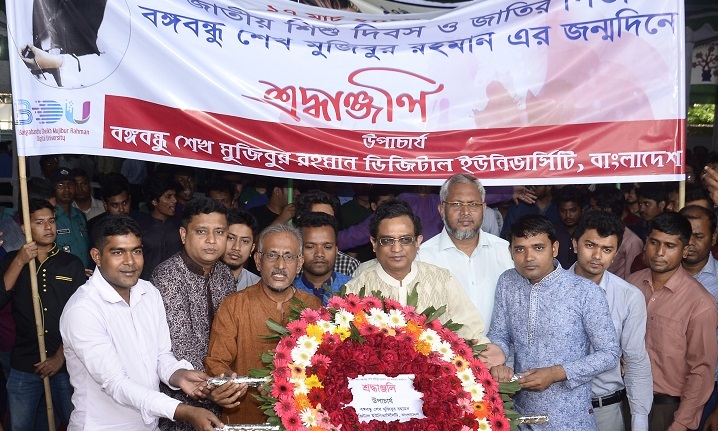 Bangabandhu Sheikh Mujibur Rahman Digital University (BDU) Vice-chancellor Prof Dr Munaz Ahmed Noor paid tributes to father of the nation Bangabandhu Sheikh Mujibur Rahman on the occasion of the 100th birthday of the great leader and the National Children’s Day. He paid the homage by placing a wreath at the portrait of Bangabandhu in front of Bangabandhu Memorial Museum at the historic 32 Dhanmondi Road in the capital this morning (Sunday), said a press release. “Holding the ideology of father of the nation, we have to build a developed Bangladesh under the leadership of the Prime Minister Sheikh Hasina”, he added.